I remember the moment I first realized I didn’t know what a bee was. It was a sunny afternoon during the second year of my undergraduate studies and I was sitting outside at a picnic table with some other faculty and students. I made a comment about the “bees” swarming our hamburgers and one professor looked at me with a raised eyebrow and pointed out that they were wasps, not bees. Growing up in the city, I hadn’t really given much thought as to what made a bee a bee until that moment. Where in my childhood had I been led astray? Bees are common figures in children's stories and television shows. The bees of my childhood made honey for hungry bears. They were hard-working hive-dwellers. They buzzed happily in flowery meadows, often to high tempo music. Their cartoonish bodies were chubby and evenly striped with yellow and black. They always had a prominent stinger on their tail end, for which I considered them foes, not friends. It’s been more than a decade since that day at the picnic table. Since then, I’ve made a career out of researching native bee ecology and conservation. The diversity of forms of our native species continues to surprise me. Like my younger self, most Canadians are unaware of the vast diversity of bee species we have in Canada and are mostly familiar with the western honeybee (Apis mellifera), a non-native species introduced to Canada to provide a sweetener for early settlers. In fact, Canada has more than 800 species of native bees. Most of our native species do not live in hives but are solitary, living in the ground or hollow stems. None of them make honey. Many of them do not sting. 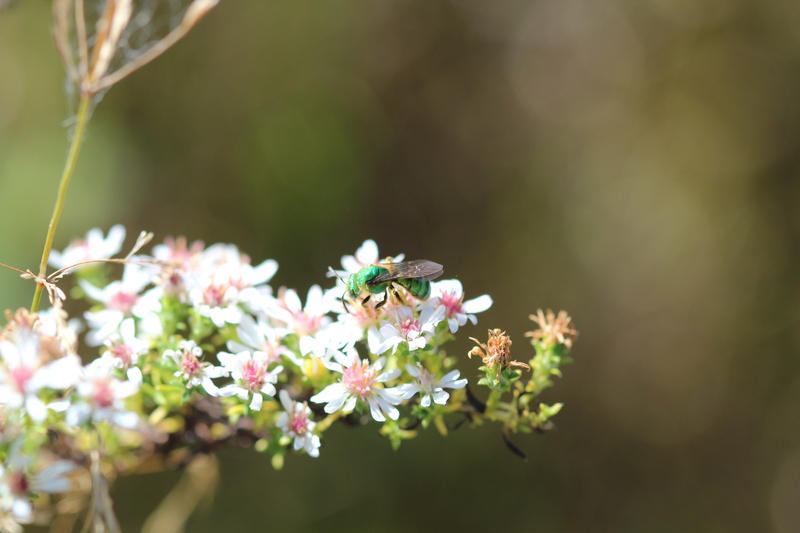 Native bees come in a rainbow of colours including blue and green, with very few of them sporting yellow and black bands. Bees evolved to utilize plant pollen for their protein source instead of animal prey. They are essentially wasps turned vegetarian and thus would never have gone after my hamburger. The perceived value of bees is bound up in their ability to perform ecosystem services for us: we must save the bees to save ourselves. The intrinsic value of bees as wildlife species with unique natural histories is rarely mentioned. Recently, I worked with the Bumblebee Specialist Group to assess all 46 North American bumblebee species for the IUCN Red List. Bumblebees are among the best studied of our native bees so it made sense to start with them. Overall, one in four species were deemed to be at risk of extinction. 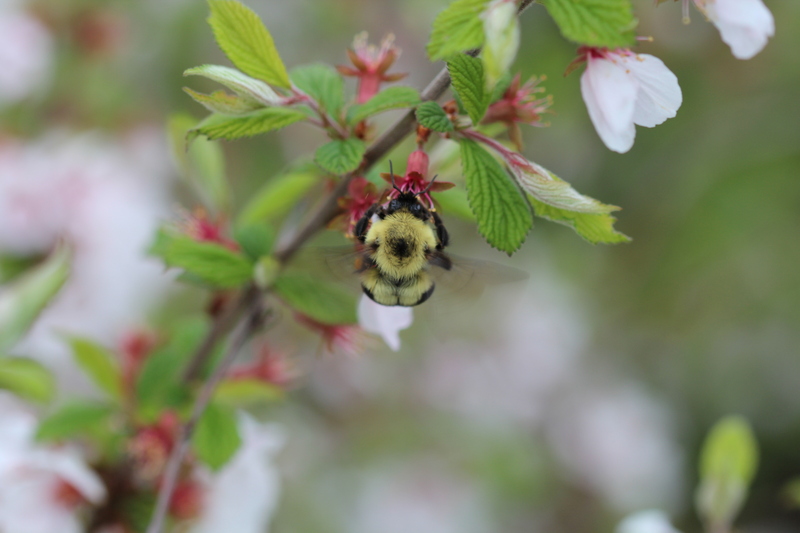 Some species, like the critically endangered rusty-patched bumblebee (Bombus affinis), have exhibited rapid, wide-ranging declines, whereas others, like the American bumblebee (B. pensylvanicus) show long-term declining trends but are still present in good quality habitat. Some species remain common and have even expanded their ranges. This indicates that bees are not a monolith. Extinction risk varies by species and by region, as do the threats each species face. However, differences between species are often ignored by the media; it’s rare to go a week without seeing an article about catastrophic “bee” declines. The rusty-patched bumblebee has not been seen in Canada since I last spotted it in 2009 at Pinery Provincial Park in southwestern Ontario. That day, I was driving around the park with a colleague and from the passenger seat noticed an unusual-looking bumblebee on the side of the road. I yelled at my colleague to stop the car and ran out to collect the bee with a vial. I put it on ice for a closer examination and confirmed it was in fact this exceedingly rare species. I’ve visited the park many times since without finding it again. Museum collections tell us that a few decades ago, it was a generalist, commonly found in many types of habitats across southern Ontario and Quebec. It fed from hundreds of plant species. Its large queens would have been among the first to emerge in the spring, happily foraging on early blooming trees and shrubs. It also is among the last to wrap up, with males being spotted on goldenrod into September. It nests in rodent burrows and overwinters in rotting logs. Compared to other bumblebee species, its tongue is quite short. To get around this, it “nectar-robs” some plant species by piercing a hole at the base of the flower, a behaviour most other bumblebee species do not exhibit. In the 1970s, 14 out of every 100 bumblebees seen in southern Ontario would have been a member of this species. But its populations have collapsed throughout its large range, most likely because of an introduced disease and/or climate change. The story of the rusty-patched bumblebee is unique, as are the stories of all of our oft-neglected and declining native insect species. Their persistence relies on our appreciation of their uniqueness and using this information to design conservation plans. People often ask me how they can help protect declining bees. In general, I don’t recommend buying bee condos and bumblebee boxes or installing honey bee hives. There’s no evidence that these help at-risk populations and may even increase threats. The first thing I recommend is getting outside to observe native species and learn to tell them apart I’ve found that being able to share with others knowledge about our vast biodiversity and differences between species is critical to understanding, appreciating and protecting them. Secondly, I recommend planting native habitat wherever possible, including flowering species which bloom in the early spring (e.g. willow) and in late fall (e.g. goldenrod). In addition to flowers, consider providing overwintering habitat, like raspberry canes and leaving logs to rot. For those who are not homeowners, you can encourage native habitat creation among your local public servants, at your local parks, neighbourhood improvement groups and schools. Lastly, I recommend contributing to citizen science efforts like Bumble Bee Watch. This can help scientists like myself assess population changes, find rare species and learn more about a species’ ecological needs. It will also help you to learn and keep track of the various species you come across, kind of like a virtual collection. Protecting our bees is critical work which requires us to examine our assumptions about wildlife and value native biodiversity. So next time you hear someone complaining about those pesky ‘bees’ at your next picnic, let them know that there’s so much more to learn. Sheila R. Colla is an assistant professor in the Faculty of Environmental Studies at York University in Toronto and a former Liber Ero Fellow. Her research focuses on pollinator conservation and ecology. The Liber Ero Fellowship Program supports early-career scientists working to improve the conservation of Canada’s wild places and natural resources. Follow them on Twitter. Related: Where have all the insects gone?